The City of Richmond has launched an innovative model designed to promote employee health and wellness while at the same time providing some much needed support to Richmond Animal Care and Control (RAC&C). The program, called Walk-A-Hound, Lose-A-Pound, is part of the City of Richmond and Richmond Public Schools Employee Wellness Program and provides a mechanism for city employees to help shelter dogs get regular physical activity. The dogs that are walked are all up to date on shots and have been behavior tested. While the program is directed toward city employees, friend and family can join them for their scheduled walks. City employees can volunteer to walk the dogs for any distance and amount of time. Hours to walk the dogs are Monday through Friday 8 a.m. to 7 p.m., Saturdays 8 a.m. to 5 p.m., and Sundays, 8 a.m. to 4 p.m.
City residents who are interested in volunteering with RAC&C, should call (804) 646-5584 to learn more about this and other opportunities. The City of Richmond today issued an updated parking lot schedule for the remainder of the Washington Redskins Summer Training Camp season. A variety of parking options have been offered to Redskins fans for a flat fee of $5 for lots within walking distance, or $7 if a roundtrip shuttle is included. DAILY parking during remainder of training camp - 7:00 a.m. to 6:00 p.m.
On Fan Appreciation Day (August 3), with the VCU and Virginia Union lots coming on line, the city believes there will be ample spaces available to accommodate needs based on usage patterns to date. Shuttle service will be provided on Fan Appreciation Day from the lots at VCU and Virginia Union to transport Fans from their vehicles to Training Camp. Fans can now also go to https://cnp.clickandpark.com/venue to reserve parking in advance. Click on Bon Secours Washington Redskins Training Center on the Venue Selection page and then indicate when you will need parking. The City will continue to provide handicapped parking directly across the street from the Training Camp on DMV Drive. Virginia Commonwealth University lots- 609 N. Bowe St. & 1101 W. Broad St.
Virginia Union University- 1500 Lombardy St.
Richmond Mayor Dwight C. Jones will preside at the ribbon cutting ceremony for the first of its new Compressed Natural Gas (CNG) fueled buses. The ceremony will be held at 11:15 am, Thursday, August 1, 2013, at the GRTC Transit System Maintenance Facility located at 301 East Belt Boulevard. Among honored guests will be a representative of the Virginia Department of Rail and Public Transportation. Immediately following the ribbon cutting ceremony, the Mayor will board the first GRTC bus fueled by CNG for its maiden trip, on a route which will deliver him to City Hall. In 2011, the Mayor’s Office met with GRTC officials about the benefits of transitioning the bus fleet to CNG fueled vehicles as retired buses are replaced. The benefits included significantly reduced fuel costs, improved air quality, and reduced noise pollution. GRTC initiated the procedure to replace vehicles, as they are retired from the fleet, with new CNG fueled vehicles for both its paratransit and fixed route services. In early July 2013, GRTC received its first shipment of 8 CNG buses, with plans for an additional 21 to arrive at the end of the year. GRTC already has 15 CNG paratransit vans that have been in service since November 2012, and has 15 additional vans on order. To support the transition to CNG fueled vehicles, GRTC’s maintenance and fueling facilities are being modified to accommodate CNG vehicles. A new CNG fueling station that will be located at the GRTC facility is scheduled to break ground in October 2013. During the ribbon cutting ceremony, informational handouts will be distributed listing benefits that CNG powered buses will bring to Richmond. Mayor Dwight C. Jones announced today that the Mayor’s Anti-Poverty Commission will be called the Maggie L. Walker Initiative for Expanding Opportunity and Fighting Poverty. The Mayor named the initiative today at a press conference mapping out the way the work of the Commission will be organized going forward. Mayor Jones spoke about the implementation plan to move the work of the Anti-Poverty Commission forward. Task forces consisting of key administrators in each policy area, issue experts, and nonprofit and business stakeholders will develop specific implementation proposals to specify what is to be done, who is to do it, timelines, metrics, and estimated costs. 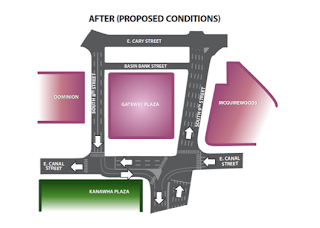 Motorists in Downtown Richmond should prepare for pending changes in traffic patterns as work gets underway for the $110 million Gateway Plaza building. 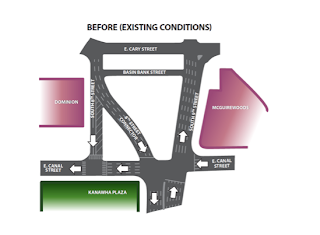 The project encompasses a city block bounded by 8th and 9th Streets to the east and west and Canal Street to the south. Northbound 9th Street reduced from 5 to 4 lanes from Canal Street to Cary Street to accommodate tower construction. Once the 8th Street Connector closes, drivers on 8th Street will turn left on East Canal, travel east on the new, one-block, two-way portion of East Canal and, then turn right at 9th Street onto the bridge approach. All related traffic and road work should be completed within the next eight to ten weeks. Signage will be posted instructing motorists about detours and changes in traffic patterns throughout each phase of the traffic conversions.